Born/lived: Salem, MA, Auburndale, a part of Newton, MA. Best known for: Impressionistic landscapes. The Charles River, Newton, MA was a favorite painting subject. Studied: Newton schools and studied at the Museum of Fine Arts in Boston with D.W. Champney, at the École des Beaux-Arts with M. Duval and the Académie Julian in Paris with Boulanger and J. Lefebvre, P. Schmitt, L.G. Pelouse, L. Joubert and E. Petitjean. Member: Boston Art Club and others. 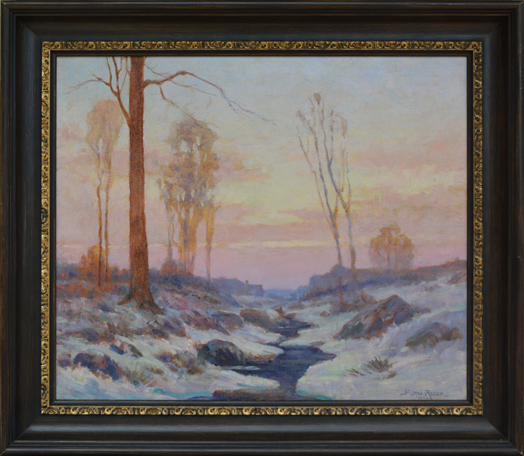 Exhibited: Paris Salon; National Academy of Design; Pennsylvania Academy of the Fine Arts; Gloucester Society of Art; Boston Art Club; Society of Independent Artists and the Newton Club. Work: U.S. Destroyer Phelps; U.S. Destroyer Charles V. Gridley; MacKay Jr. H.S., East Boston; Brooklyn Institute of Art and Science; Bowdoin College; Harrison Gray Otis House, University Women’s Building, Boston; Virginia Public Utilities Building, Alexandria; Florida Power and Light Company, St. Petersburg; Seigle Building, Boston; Plymouth (MA) High School. Taught: professor of art at Lasell Junior College and Mt. Ida Junior College, both in Newton, and superintendent of art in the Dedham public schools. Comments This painting is in good condition in a frame, also in good condition.